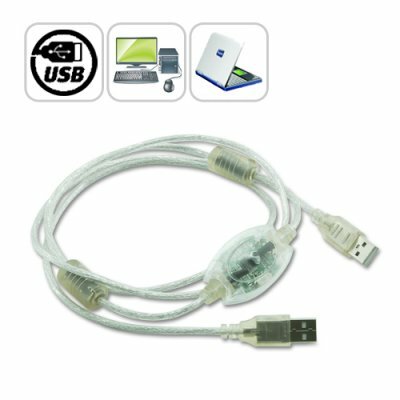 Successfully Added USB Easy Transfer Cable - Direct Link Computer Accessory to your Shopping Cart. This special easy transfer USB cable is designed to allow easy file sharing between two separate computers. Instantly share files and transfer data conveniently at super fast speeds. This easy transfer USB cable uses a special design to eliminate drivers completely, thanks to the cleverly added flash chip incorporated within the USB cable. Simply connect this USB direct link transfer cable to each computer and it's ready for use! If you're looking to transfer your entire user account from your old PC to your new PC, then this easy transfer USB cable is what you need. Transfer your entire user account or all user accounts from one computer to another with just a few clicks, or you can make custom selections of the data and folders you wish to transfer. This great new USB gadget is extremely useful for users looking to replace a Windows XP-based computer with a Windows Vista or Windows 7 based computer. This amazing new computer accessory comes specifically designed to give the average PC user the know-how and method to easily share and transfer data between two computers. Click "Add to Cart" now, and we'll express ship you a sample straight away. This exciting new computer accessory is brought to you by the leaders in wholesale China electronics provider, Chinavasion. This great new computer accessory gadget is available now at only a 2 MOQ (Minimum Order Quantity) for a limited 60 day run, after which it will be a bulk/wholesale item. Get your samples in today and experience the simplicity of transferring files from one computer to another without requiring a network setup. If you're running a Windows or Vista OS, then just connect the USB cable to each PC and start transferring and sharing file within seconds! Can this USB easy transfer cable also work on an Apple Computer? This PC to PC easy transfer USB cable is designed to work only on Windows based computers. Can programs applications be transfered from one computer to another? Programs applications cannot be transferred using this easy file transfer USB cable.